I am an online integrated customer view citizen product info & application forms professional the current situation - online ? I am an agenda my amsterdam prototype challenges - agile or waterfall? I am a challenge - agile or waterfall? I am an agenda my amsterdam prototype challenges - agile or waterfall? - make or buy? make or buy? Using modern technologies and hosted in the cloud, a new UI and information model were built for Atlas, a map-based geographical information system. a challenge - make or buy? The “Report Nuisance” app was tested with 150 users, is managed by the upholders and used by the neighbourhood. The number of resolved complaints has increased. connect with the organisation and people will be exhilarated! View My Amsterdam on Notist. 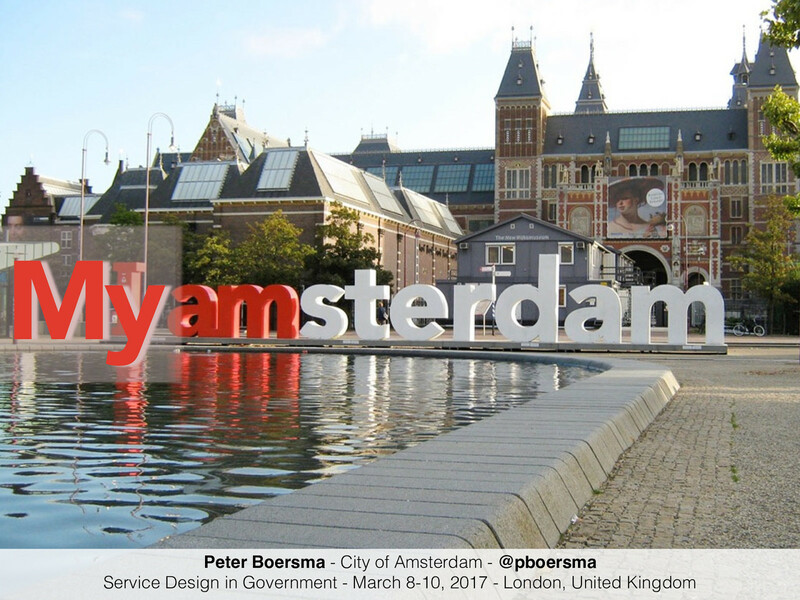 This year, an online service called Mijn Amsterdam (My Amsterdam) will be launched to provide citizens of Amsterdam with up-to-date information about the status of any interactions they have with their local government. The collective statuses create an integrated customer view that will allow civil servants to make better decisions for individual citizens as well as for the collective population. The service aims to connect citizens and government, but also to connect many information systems and partial user profiles - creating the integrated customer view. In the process of defining, designing, implementing and evaluating the service, the team - made up of designers and developers, a few civil servants responsible for citizen-facing contacts and supporters from all over the city - has learned many valuable lessons. In this presentation, I'll share some of them - they will be interesting for all designers of interactive systems, and the session is aimed at a wide audience. Peter puts presentations on for free. You can too.